Airtran Airways was established in 1993 as USA's low cost airline carrier with parent company being AirTran Holdings. Being one of the largest budget airlines in the country, Airtran Airways operates scheduled flight services of over 750 flight everyday, covering over 40 destinations across eastern USA and the Midwest. The airline company has 6700 employees with main base at Orlando International Airport and having its hub located at Hartsfield-Jackson Atlanta International Airport which is considered to be the world's busiest airport in terms of passenger volume. The budget airline carrier with low fares are specially designed for business travelers and offers business class seats. The newer planes are well equipped with XM Satellite Radio and EasyFit. 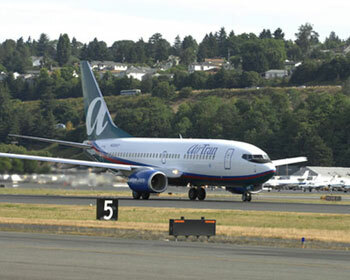 Airtran Airways has a passenger fleet size of 137 and its aircraft are mostly of Boeing 717-200 and Boeing 737-700 types. In fact the company operates one of the youngest Boeing aircraft fleets in the airline industry. Besides the XM Satellite Radio and EasyFit, AirTran also offers its passenger snacks and Coca Cola products. Passenger can purchase alcoholic beverages in the main cabin at a nominal fee whereas it is made complimentary in its Business Class cabin. Being a cashless airline policy, AirTran can only accept credit and debit card payments for any purchases made onboard.